Galls found on a wild Laminaria digitata by YB. at the Atlantic/Clachan Bridge, Argyll, Scotland (56°19’02.7″N 5°35’00.2″W) on the 11 July 2017. Pictures of the full algae would have been helpful in case of species identification doubt. Pictures of a healthy alga make the comparison and the symptoms description easier. 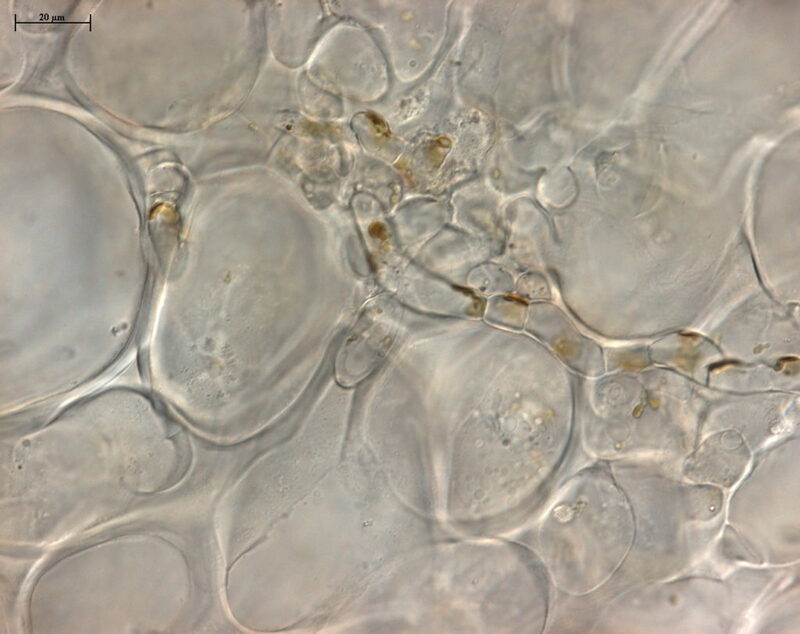 A tissue sample of a healthy alga would have help for the microscopy and the DNA analysis. Some material corresponding to all three areas harvested have been hand cuts and observed under a microscope. All the tissues observed contain a filamentous brown algal endophyte, including the one harvested on flattened area of the stipe. As said before, a tissue sample of a healthy algae would have preferable. Closer observation shows it has helicoid plastids and, most likely, pyrenoids. 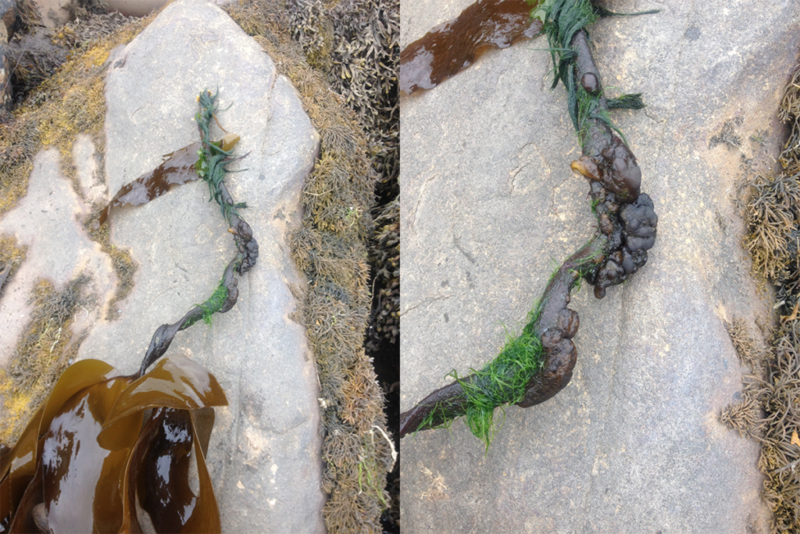 The Laminaria digitata seems to be infected by a brown algal endophyte (ie. Ectocarpus, Laminariocolax, Laminarionema…). According to the scientific literature, the prevalence of the endophytic algae could be quite high in a population. It can cause a range of symptom: galls, distorted stipes, crippled lamina, dark spot on the lamina, warts on the stipe but for the majority of the kelps, the infection is asymptomatic. The full stipe of Laminaria digitata and zoom on the galls. The stipe of Laminaria digitata infected by a brown algal endophyte under the confocal inverted microscope.